What a crazy winter it’s been! RIP Winter 2011/2012 – We hardly knew you. My first winter back in Boston full time, and nothing has happened! I am disappointed, but on the plus side, I had no problems commuting. Whenever it snows, the T gets even less dependable. Also I didn’t have to shovel much at all! 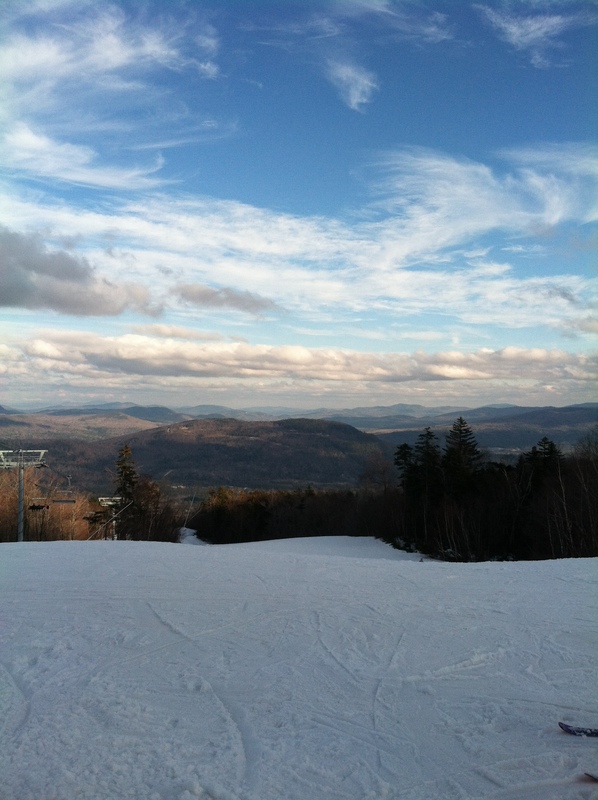 The downside to this crazy season formally known as winter is that I haven’t gone skiing nearly as often I could. Granted not having a car or a license did limit me, and by next winter I hope to at least be able to drive so I could borrow a car. But there is s commuter rail stop within a shuttle ride’s distance to one Massachusetts mountain, and the MBTA did run trains in the morning and evening with ski cars. 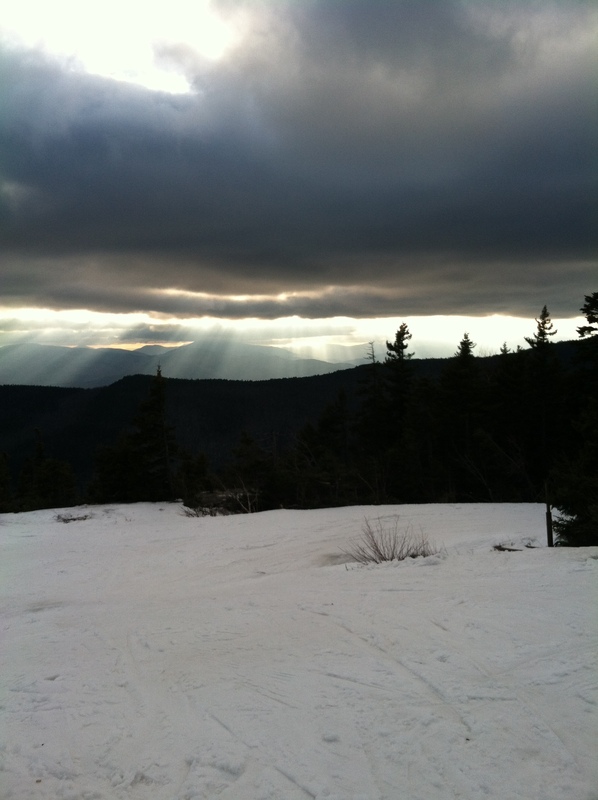 I did go up to Sunday River for my yearly pilgrimage over New Year’s Weekend. The winter up there had been so slow going, that over half the trails were closed. Yet because it was a holiday weekend the resort was charging $80 bucks a pop. At least the views were worth it. 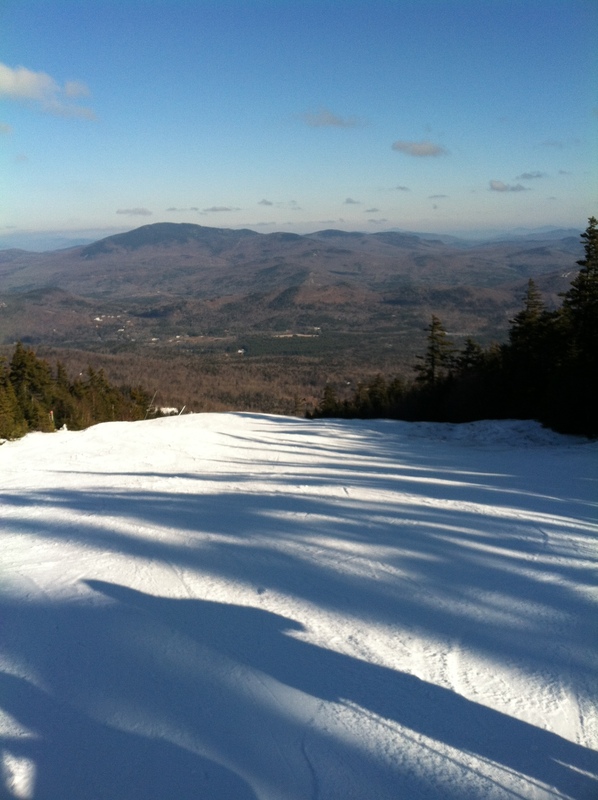 So now with March already halfway done, I am heading back up to Sunday River for one last (and my second) trip. The days up there, according to the mountain, alternate between spring skiing days with potential for goggle tans and warmish winter, depending on the cloud cover. During the season they managed to get 100 days of snowmaking in, but for the past week or two have held off on the guns, waiting for Mother Nature to cool down. (I don’t think that’ll happen though) The snow has been soft, which is great. I just hope there’s some left when I get up there tomorrow! 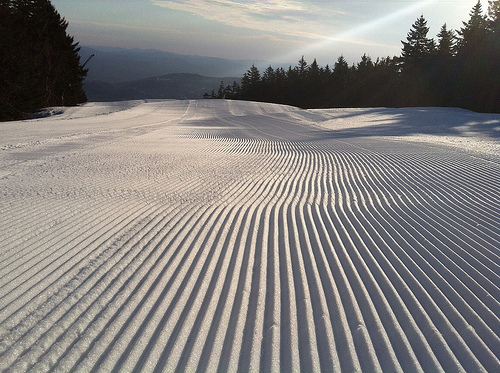 Tonight I’ll be dreaming of corduroy snow. Interesting 48 hours or so weather wise. Yesterday was the day for my Dad to come down and pick me up from school. As I needed to check out of my dorm, since I’m studying abroad in Munich next semester, things were complicated by the fact that I needed to bring EVERYTHING home. I had all day to pack on friday, as followers on my Twitter noticed. But I still didn’t manage to finish packing the night before. I awoke on Saturday with the news shows absolutely buzzing about this Nor’easter/Blizzard/OMG SNOWPOCOLYPSE!!! And I have to admit the video of President Obama getting off of Air Force One the night before was quite impressive. Props to the pilots being able to land that huge jet in a white out. You could barely see the plane (the half painted white was completely gone) and you could barely catch glimpses of Obama walking down the stairs in between the snow flakes whizzing by the camera, almost sideways. I checked the LI ferry website and they had already canceled their service in preparation of the storm. This complicated my Dad’s travel plans. We had to get off LI before it started snowing. Dad decided to go through the Bronx (using the Throggs Neck Bridge) and take the parkways to 91, the way Mom usually goes. Thankfully we loaded up the car and started driving at 1115, only an hour or so behind schedule. The forecast said NYC and CT would start seeing snow around 2 at the latest. We were still in CT and didn’t see any snow when they said it would start snowing. In fact, as we drove West, and a little by little North, the sky kept getting thinner and lighter. The storm actually stalled over LI and NYC. Snow was supposed to fall in Boston around 6 or so, but 6 hours later, it had just started flurrying. The ground was still too dry (and maybe a little to warm) for it to stick when I went to bed. I finally awoke to a winter wonderland this morning, only 36 hours or so shy of the Winter Solstice. I only hope we don’t get dumped on as much as DC, and LI.